Kathryn M. Rudy : Medieval Parchement from IKKM on Vimeo. Talks about growing a medieval parchment by stitching in items to it. 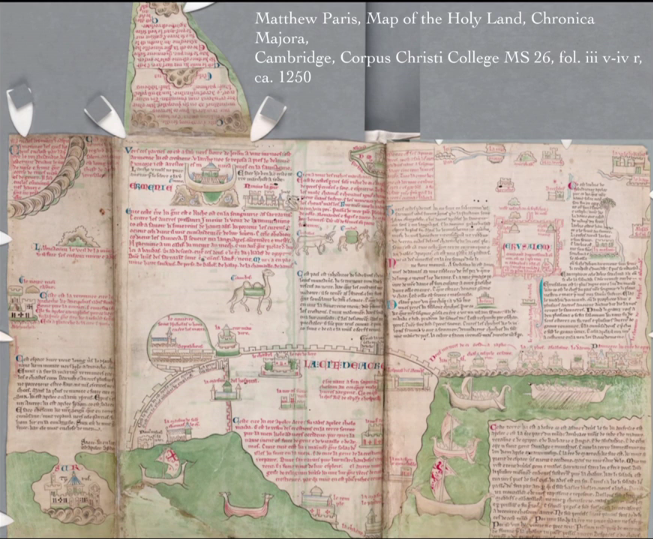 Introduction: I’m going to begin here with the famous book by Matthew Paris, who makes a series of maps of the Holy Land, and what’s specific and really exciting about this one is that he makes this visual argument that if you want to extend your world you just a piece to it. These maps actually have bits that fold out, so that the left-hand bit folds back in, as does the top one. These added bits not only make the available space larger, but they require the user to perform this additional action of unfolding in order to reveal the world. Kate Rudy's IKKM Project from IKKM on Vimeo.